I launched Bloginuity a few weeks back, in partnership with blogging expert Tony Newton. We closed it after a few days because the demand far outstripped the number of places. We’ve done some restructuring, and brought a few new ideas on board so we’re now opening the site again to new members. You can read the full details at Bloginuity.com but here are a few details you might want to know. Firstly you’re not going to find anything like this for the crazy price we’re offering. To tie in with my passionate belief that starting an Internet Marketing business should be affordable to all, we’ve kept the monthly fee at a level where many people won’t even notice it. And you should be more than covering your membership fee pretty quickly soon. 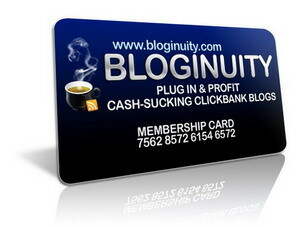 Bloginuity basically supplies you with a plug-in-and-profit Clickbank review blog each month. You just plug in your ClickBank ID, make a few tweaks to make your review blog unique and upload it. The totally unique blogs we provide each have 5 ClickBank product reviews. Since your CB ID is embedded in all the product reviews, you profit regardless of which product your visitor buys. Check out Bloginuity.com for more details. Remember you couldn’t even get five review articles written for the crazy price of a Bloginuity membership let alone get five top qaulity reviews, a unique Clickbank review blog, graphics, and everything else! I’ve actually just spent a part of today setting up the bloginuity system that you are speaking about. You guys certainly know what you are doing with a product! It is all in there for you. Yes, you have to do some work but heck, if you aren’t prepared to set up a blog, add a theme and spin a couple of articles then you don’t deserve to get anywhere anyway. Then it’s up to us to promote the product and I’d be interested to hear what you would feel is the best method for promoting the review blogs.